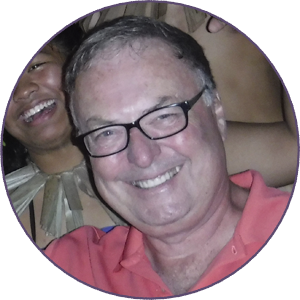 Dr. Kevin Arnold was enjoying semiretirement, but was presented a once-in-a-lifetime opportunity to take a locum tenens assignment in Guam. He jumped at the chance, and ended up fully embracing the culture and lived “like a local.” He’s experienced things that are completely unlike anything he’s encountered in the continental U.S. The working conditions have proven challenging – but rewarding. He even began a blog to chronicle his adventures. When Dr. Arnold and his wife arrived in Guam, they were initially contending with extreme jet lag: it took them two days and 20 hours of flight and travel time, on top of a 16-hour time change. “Linda and I celebrated a typical New Year’s by sleeping through it,” he jokes. Not only did they have to modify their shopping style, but the cost of goods was about 25 percent higher due to the remoteness of the island. The variety was astonishing, though, since Guam is home to a variety of cultures due to its proximity to other island systems. “The selection is eclectic; there was one whole aisle of noodles, ramen, rice, and other items I couldn’t even pronounce, much less spell,” he says. They also encountered the Tuman Fair, where they were surrounded by booths with new ways to enjoy chicken, rice, and exotic salads. “This hospital cares for the local people who may have no – or lousy – insurance. Need to get a culture to a pathologist? It has to go to Hawaii or the Philippines, so I can expect a one-week turnaround,” he shares. Not only are the clinic conditions different, Dr. Arnold has encountered cultural challenges. With a patient population that diverges from what he’s used to seeing in ERs and urgent care clinics in the continental U.S., he’s aware that he has to adapt his patient communication style. With the average yearly temperature a balmy mid-80s, Dr. Arnold and his wife were able to do some exploring of the island, and he’s also made a point of learning all he can about the island that’s become his temporary home. “One highlight of our adventures was visiting the Pacific War Museum, a museum dedicated to the war in the Pacific in World War II,” he continues. Guam is one of the islands of Micronesia, located seemingly in the middle of the Pacific Ocean, about three thousand nautical miles north of Australia. It’s also one of five unincorporated territories of the U.S. and houses both an air force and naval base. Regardless of the U.S. presence, Guam has its own rich history, with the indigenous peoples – the Chamorros – having inhabited the island for over 400 years. A big part of loving – and living — the island life is enjoying the local food. “We’ve eaten red rice, sweet potatoes, whole crab, mahi-mahi, short ribs, shrimp cakes, fish stew, mango bread, and Finadene Sauce [the locals’ condiment],” he shares. Dr. Arnold decided at this point in his career, he’d overcome his inertia and do some exploring, but – more importantly – give back to a community in need, and working an assignment in a facility chronically in need of staffing help.